I only took pictures of the planes, not the birds. I went to an air show at Jones Beach, which is now an annual event on Memorial Day weekend and I saw a lot of displays like this. 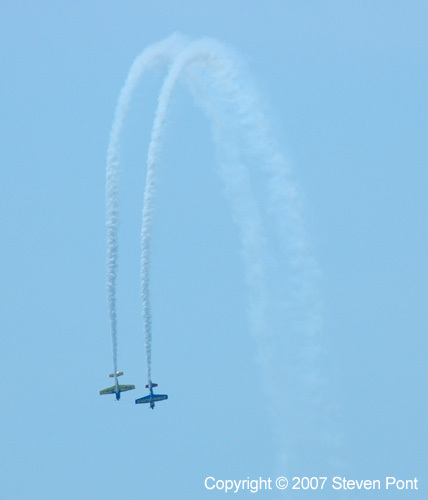 There were propeller planes doing all sorts of stunts, like steep climbs, dives, stalls, and corkscrews. These pilots are obviously very talented and they are there to put on a show, but as performers, they miss out on any kind of reaction from their audience. Most performers feed off of the energy of their audience, but with these guys, it's just "do your job and go home". I suppose the pilots could buzz the crowd* to see if they were clapping or smiling, but that might just scare people off. *If you don't know what "buzzing the crowd" is, please go watch Top Gun with Tom Cruise. Normally I wouldn't recommend a Tom Cruise movie because I think he's a jackass, but maybe he made that movie before he became a jackass. If you can watch it with a pilot (or someone who used to be in the Navy), it's even better. When I was in the Navy, we always buzzed the crowd. If they didn't applaud, we made the second pass a strafing run! Then we sang, "You lost that loving feeling..." in the bars later on. It was all good fun.